A hand fabricated, platinum solitaire, engagement ring with stirrup shaped shank, 2.5 millimeters at back slightly tapered to top. This ring features one laboratory created, 0.37 carat, round brilliant cut, cultured diamond, fancy intense pink color, VS1 clarity. EGL report. 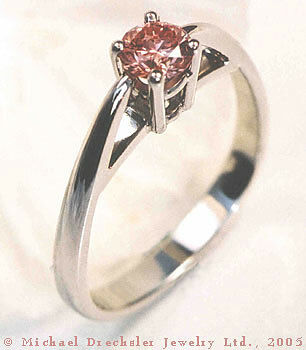 This ring is designed and hand crafted by Michael Drechsler Jewelry Ltd., 2005.